A diesel power generator uses the combination of a diesel engine and an electric generator for the generation of electricity. 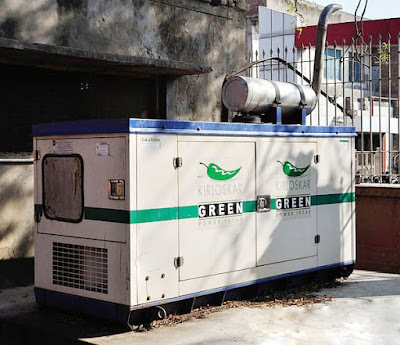 Diesel generators are generally used in cases of emergency when the power supply from the grid is unavailable and where continuous power supply is important, such as hospitals, airports, large industries, movie theatres etc. They can also be used at places where the power grid is not available. A diesel generator set may be enclosed in a sound attenuated enclosure along with the control circuits and circuit breakers. They are also referred as a diesel genset (short form for generator set). They are compact in size and, hence, can be located wherever required. Diesel generators are available in a wide range of ratings and sizes, from few kVA up to few thousands kVA. Portable diesel generators may come with ratings between 8 to 30 kVA (single phase) and can be used in homes, small offices etc. Larger generators up to about 2500 kVA (three phase) are also available which may be required in industries, airports etc. A diesel generator set employs a Compression-Ignition (CI) diesel engine as the prime mover of an electric generator. Obviously, the primary fuel for a diesel generator is diesel. The shaft of the engine is coupled to the shaft of an electric generator (alternator). The diesel engine drives the coupled generator which then generates electrical power. When a conductor moves in a magnetic field, an emf is induced within the conductor. This principle is used to generate electricity in any electric generator. Learn more: how an electric generator (alternator) works. Diesel generators are widely used in most thermal and nuclear power stations as an emergency backup power source for the station’s critical auxiliary equipment such as cooling pumps, fans, hydraulic units, battery chargers, etc. For example, during a power interruption in a nuclear power plant, it is very necessary to keep the continuous power supply for reactor cooling pumps. There are backup battery banks to keep a continuous supply of the critical equipment. Diesel generators supply the battery chargers and also other auxiliary needs. In hydropower plants, diesel generators may be used to provide emergency power to the spillway gates which are used to prevent the water from flowing from the top of the dam in flood conditions. Diesel generators are also required in the switchyards. Circuit breakers, protective relays, transformers and communication system that is used to control these devices, all require a backup power source in case of power failure. There are many parts of the world where, using diesel generators is the only viable option for providing electrical power to the local population reliably. This is generally due to the geometrical conditions that do not allow the power grid to reach such areas or isolated communities. In such cases, two or more diesel generators operated in parallel are used to provide a reliable power supply to the local population. A diesel power plant has more than two generators that operate in parallel. For the parallel operation, the generators are electrically connected in synchronization (matching voltage, frequency and phase). A diesel power plant may or may not be connected to the main power grid.